Saudi Aramco and Air Products announced the signing of an agreement to jointly-build the first hydrogen fuel cell vehicle station in Saudi Arabia. The collaboration between the two companies will combine Air Products’ technological know-how and experience in the field of hydrogen with Saudi Aramco’s industrial experience, facilities and R&D capabilities. Both companies will establish a pilot fleet of fuel cell vehicles for which high-purity hydrogen will be dispensed at the new fueling station. “Hydrogen fuel cells offer an effective means for the electrification of transport while maintaining easy, five minute refueling and long driving ranges,” said Ahmad O. Al Khowaiter, Chief Technology Officer of Saudi Aramco. “We are honored to work on another venture with Saudi Aramco to establish and develop a sustainable hydrocarbon-based hydrogen supply system for pilot demonstration of a fuel cell vehicle fleet in Saudi Arabia,” said Dr. Samir Serhan, Executive Vice President at Air Products. 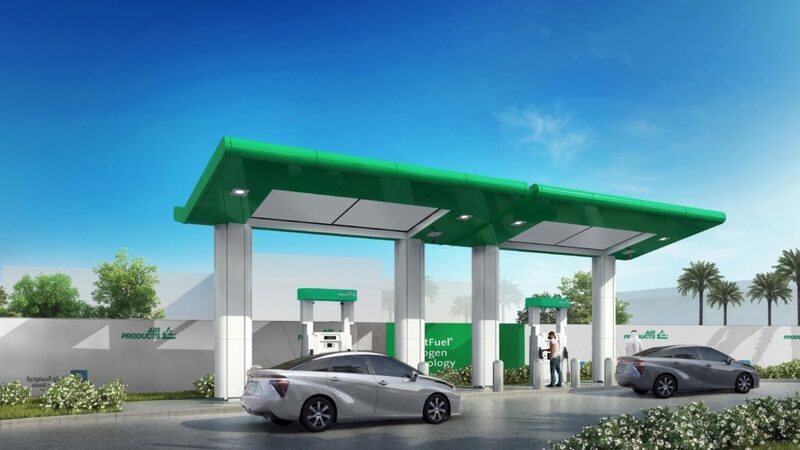 The hydrogen refueling station will be located within the grounds of Air Products’ world-class Technology Center in the Dhahran Techno Valley Science Park. Toyota Motor Corporation will supply its Mirai fuel cell cars for testing in this pilot project.